A poem dedicated to friends on another site but let me also share this piece with you.. Feels like a crumpled paper? And then thrown into the water.. But waste no time on grief. Don’t let anger and sadness reign. 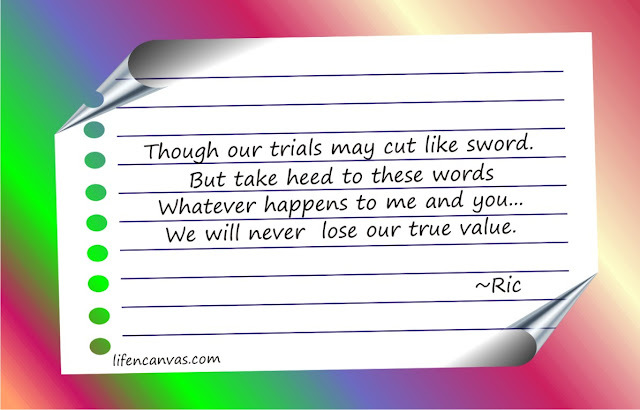 Though our trials may cut like sword. We will never lose our true value. Stand up now with head up high. You need not know the reasons why. Open your mind and see the good. Keep feet on the ground as you would. Very well written and the message is good for all. It is universal. To friendship, a toast! well written.. kaka-relate... keep writing poems... talent 'yan sir! Now, I need to unload all the heavy burden of the past and start to move on! Thank you for this! beautiful poem :))) keep it up. Another masterpiece! I loved it. Thanks for sharing! Have a good day, everyone!! Take care! I was smiling! I dont know why!